Posted on January 16, 2014 by epuszczewicz. Question: What measurement or measurements do I need to make when auditing an ESD worksurface? Thank you for taking the time to submit your question to Transforming Technologies. For general auditing purposes, the primary measurement is RTG. 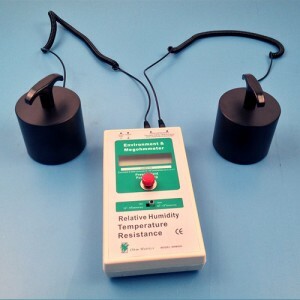 This measurement is made using a 5 lb electrode connected to the positive terminal of the resistance meter. The electrode is placed on the work surface in the most heavily used area. The negative lead is connected to electrical ground. 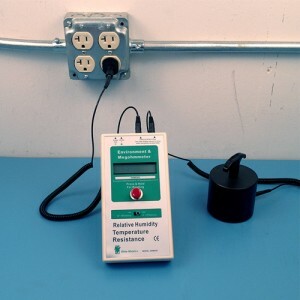 This measurement assures that the mat is connected to AC Equipment Ground. ESD standard procedure says to test at 10 volts, and if the measurement exceeds 1.0 x 106 ohms, switch to 100 volts. If you are certain that your worksurface material has a resistance greater than 1.0 x 106 ohms, you may want to start at 100 volts to save time. A simple and safe way to connect to AC Ground is by using a grounding plug, such as the Transforming Technologies AD22. The AD22 assures a solid connection to the third wire ground of an AC outlet, while insulating the plug from the hot and neutral wires. Always check electrical outlets for proper wiring before using grounding plugs. If the resulting RTG measurement is within your required limits, no further work surface testing is required and you can proceed to the next work surface. Should the RTG measurement exceed your limits, clean the work surface with an approved cleaning product, check all wiring connections to make sure that they are secure and re-test. Should the measurements still exceed your limits you will then want to conduct a Resistance to Groundable Point (RTGP) measurement. This measurement is similar to the RTG measurement except that the negative lead is attached to the grounding point (snap) of the work surface. The testing is performed using 100 volts when the expected resistance is greater than 1.0 x 106 ohms. Should this measurement provide a reading that is within your requirements the problem is somewhere between the snap and AC Ground. Typically, either the ground wire became disconnected or it is faulty. Check and verify all wiring between the work surface and the AC equipment ground. If this measurement also provides a value that exceeds your requirements, then there may be a problem with the work surface. A point-to-point resistance measurement can be done to verify the performance of the work surface material. This measurement is made using two 5 lb electrodes. The electrodes are placed 10” apart on the work surface in various locations. Figure 3 is an example of a point-to-point test. 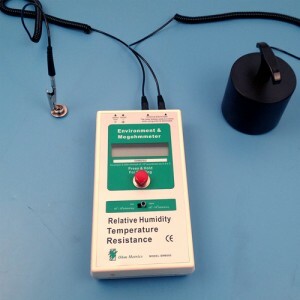 The testing is performed using 100 volts when the expected resistance is greater than 1.0 x 106 ohms. If the reading meets your requirements, there is possibly a connection problem with the groundable point. Should the reading exceed your limits the work surface is likely faulty and should be replaced. It is important that RTG measurements be made regularly. The frequency of testing is dependent up on internal requirements and testing history. RTG testing must be performed even if constant monitoring is in place, as constant monitors verify ground connection of the worksurface, but not the performance of the worksuface.